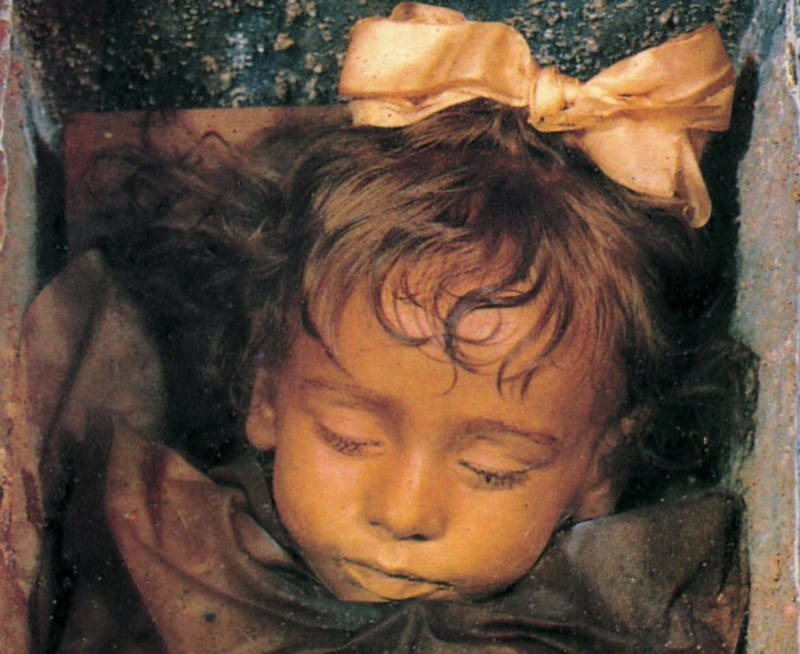 Not only did a secret formula allow Rosalia Lombardo to become one of Earth's best-preserved mummies, but many even swear she can open her eyes. In the depths of an obscure Sicilian catacomb, there lies a young girl in an open casket. Her name is Rosalia Lombardo and she died at the tragically young age of two due to complications from pneumonia in 1920. Her father was so grief-stricken that he sought the aid of an embalmer to preserve his child. The embalmer, Alfredo Salafia, then mummified Rosalia Lombardo so perfectly that her internal organs are still intact a century later. Indeed, it is difficult to gaze upon the tiny body in the glass coffin and not believe that she will awaken at any moment. Her skin is still smooth and porcelain, and her golden hair is neatly tied back with a large, silk bow. And most hauntingly, her crystal blue irises are visible underneath her blonde eyelashes. The gaze of Rosalia Lombardo is what has fueled Sicilian lore for the past hundred years. She is among one of 8,000 mummies in the catacombs underneath the Capuchin convent in Palermo, Sicily and of the thousands of visitors that flock to see the blonde-haired girl, many report witnessing her eyes slowly open. In fact, a popular composite of several time-lapse photographs appeared to reveal Lombardo opening her eyes by a fraction of an inch. While this set the internet ablaze with tales of the mummy who could open her eyes, in 2009, Italian biological anthropologist Dario Piombino-Mascali debunked the central myth surrounding Rosalia Lombardo. “It’s an optical illusion produced by the light that filters through the side windows, which during the day is subject to change,” he revealed in a statement. Piombino-Mascali made this discovery when he noticed that the mummy’s case had been moved by workers at the museum, which caused her to shift slightly, allowing him to see her eyelids better than ever before. “They are not completely closed, and indeed they have never been,” he said. So, when the light changes and hits her eyes at different angles, it can appear as though the eyes are opening. Furthermore, Piombino-Mascali also managed to discover the elusive formula that was used for Lombardo’s impeccable preservation. When Salafia passed in 1933, he took the secret formula to the grave. Piombino-Mascali tracked down the embalmer’s living relatives and uncovered a trove of his papers. Among the documents, he stumbled upon a handwritten memoir in which Salafia recorded the chemicals he injected into Rosalia’s body: formalin, zinc salts, alcohol, salicylic acid, and glycerin. Formalin, now widely used by embalmers, is a mixture of formaldehyde and water that eliminates bacteria. Salafia was among one of the first to utilize this chemical for embalming bodies. Alcohol, along with the arid climate in the catacombs, dried Lombardo’s body. Glycerin kept her body from drying out too much and salicylic acid prevented the growth of fungi. But it was the zinc salts, according to Melissa Johnson Williams, executive director of the American Society of Embalmers, that was the key element in retaining her remarkable state of preservation. Zinc, a chemical no longer used by embalmers, petrified her small body. “Zinc gave her rigidity,” Williams said. “You could take her out of the casket prop her up, and she would stand by herself.” The embalming procedure itself was very simple, consisting of a single point injection without any drainage or cavity treatment. Additionally, Rosalia Lombardo is now housed in a new glass case. “It was designed to block any bacteria or fungi. Thanks to a special film, it also protects the body from the effects of light,” Piombino-Mascali said. Now, Piombino-Mascali hopes, tourists will stop fabricating “totally unfounded stories” about the child mummy.